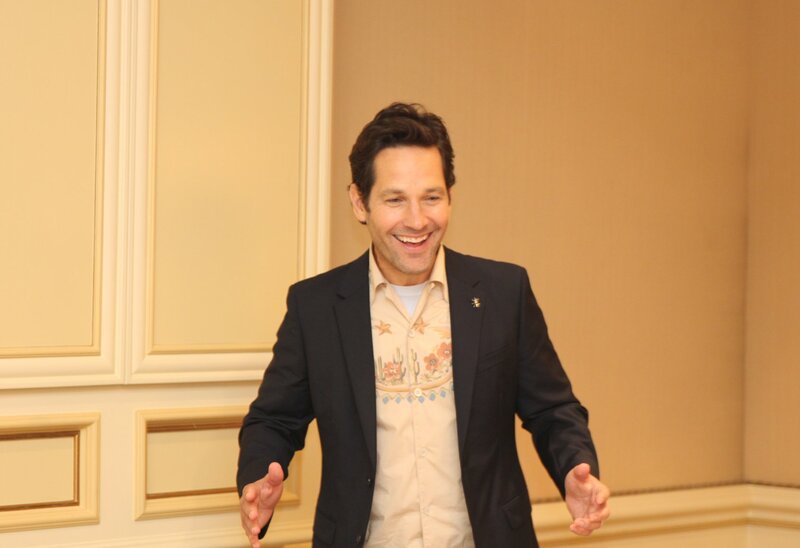 Paul Rudd Ant-Man and The Wasp Interview ~ He's back and funnier than ever! Paul Rudd. He’s charming, handsome, funny, nice, engaging, and one of my favorite actors to chat with. This time around he gives a little more comedy and keeps it all family safe. 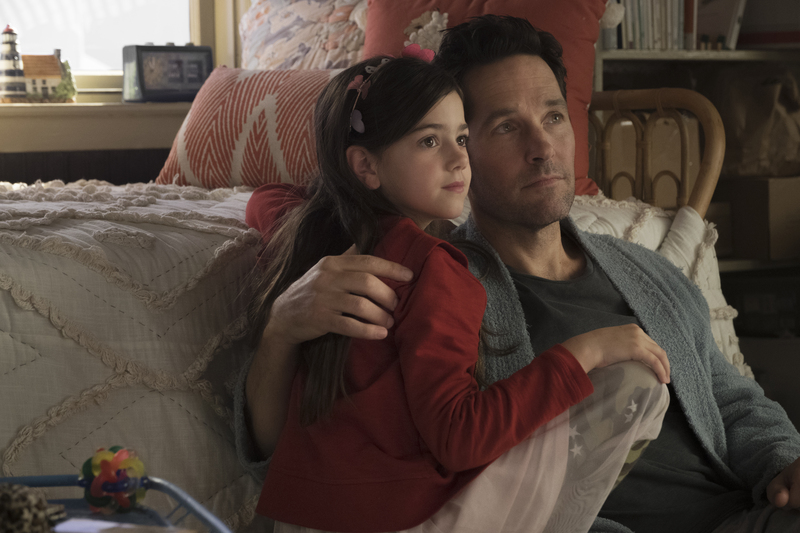 In this Paul Rudd Ant-Man The Wasp Interview, you will read about what it is like to him playing a dad to a daughter close to the same age as his own. He also talks about being friends with Michael Douglas and co-writing Ant-Man and The Wasp. 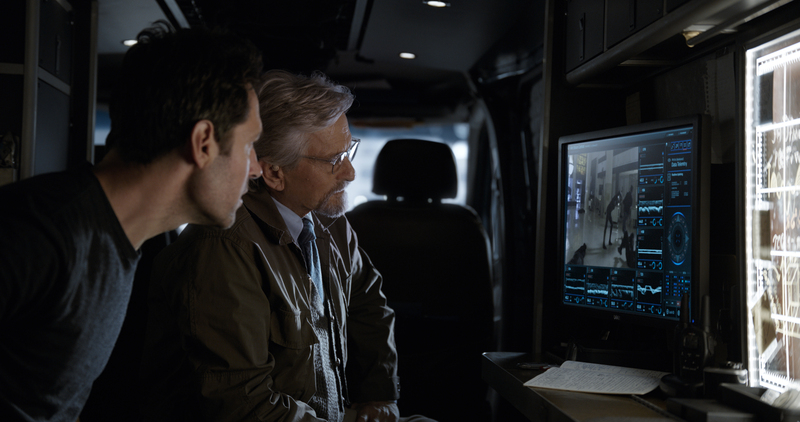 After his exploits with the Avengers in “Captain America: Civil War,” Scott Lang, the good-hearted ex-con, finds himself under house arrest. 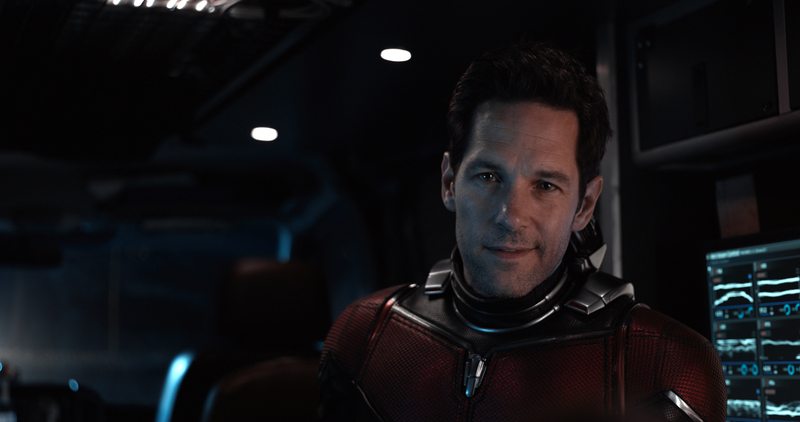 But when he faces the decision to once again don the Ant-Man suit, Scott is conflicted, as he is struggling to find a way to get his life back on track and be the best possible father to Cassie that he can be. When the person we interview comes into a room we always applaud. Their reactions are always fun to see. 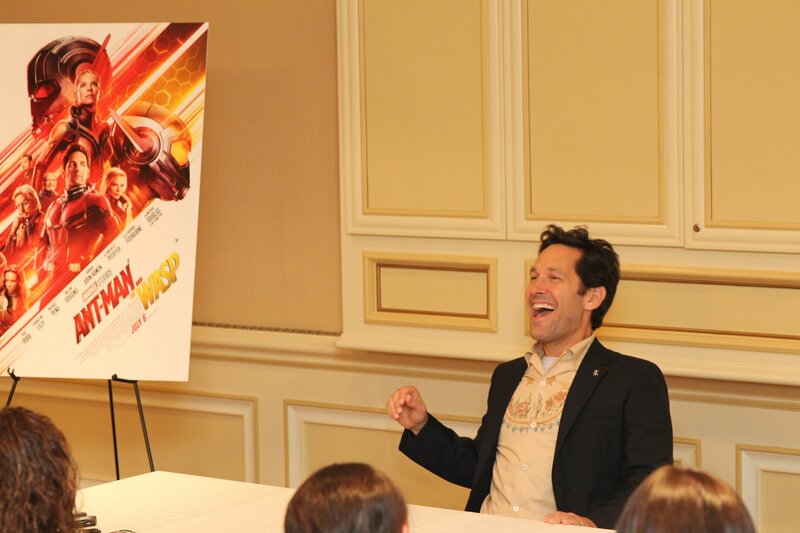 Paul Rudd was taken by surprise and clearly excited. I’m not going to joke, I was like my reaction is just to immediately join in. (Laughing) My heart is racing. Yeah, they asked me do you want coffee, I don’t need coffee. 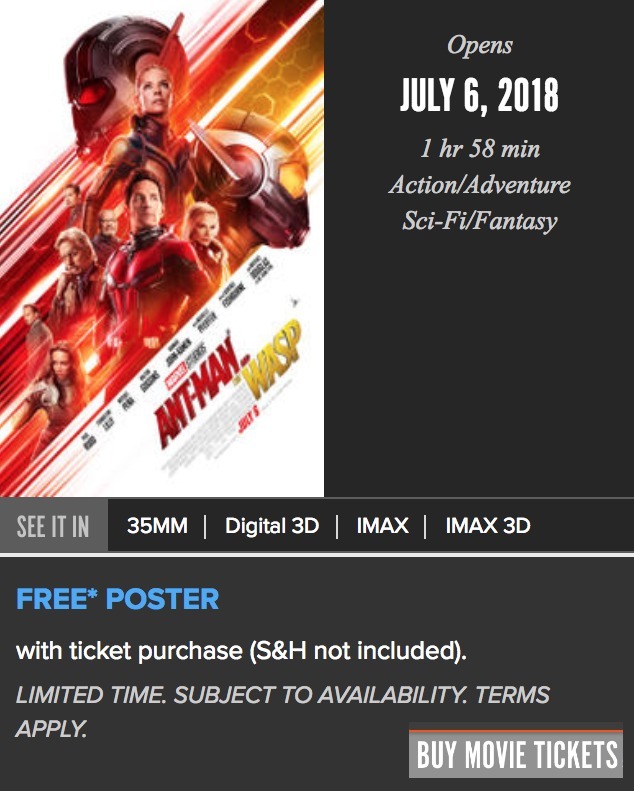 How is it back for Ant-Man part two? It’s great, it’s always a strange thing when it’s coming out. You put so much work for so long into something and that it’s finally finished is a unique feeling. It’s exciting when you like the finished product. Because you can talk about it and you don’t have to manufacture enthusiasm. But the filming of it, the experience of it, has been nothing but fun, hard work but really enjoyable. 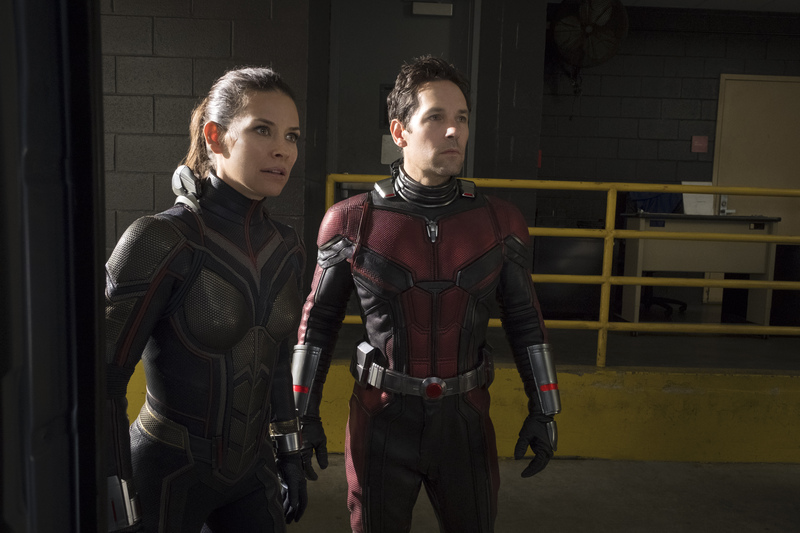 Can you talk about co-writing Ant-Man and The Wasp? It had already been established. People know the characters and accept us in the roles, I think. And because of that, we were able to lean into comedy or lean into whatever it is we were doing a little bit more, we didn’t have to explain it, we just thought people will go along with this. And also, certainly, with the Scott Lang role, I’ve already now been in Civil War. And in Civil War, the Russo Brothers really wanted to lean into the comedy of it. 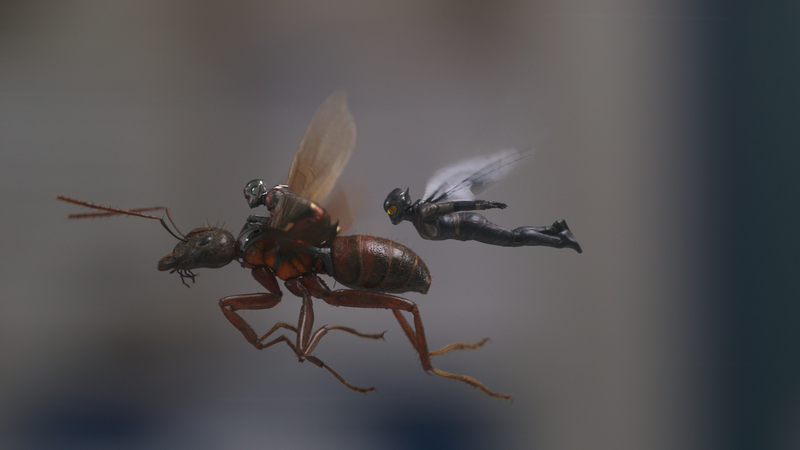 During the first Ant-Man, there were many discussions that we all had about where do we modulate this. How serious should Scott be, how funny? Because it’s a superhero and you’re also Ant-Man, it seemed like a strange one, to begin with. (laughing) So I think everyone was finding their footing a little bit (the first film) and in this one we kind of hit the ground running. I love the fact that it’s such a family-friendly movie. It is the one Marvel movie that is for the entire family. The comedy was on point. Was that something that you guys wanted? Yes, we feel that we have our own kind of space within this Marvel cinematic universe and our own tone with the films. And while we want it to work within the MCU and want it to be enjoyable for all ages, we’re dealing with parents and children. This is a theme that runs throughout this story. And a lot of kids want to see these movies, and sometimes there are some scary things in them. I love the fact that we finally have a father in the Marvel cinematic universe and that there’s also a blended family. There’s a lot of representation in this. Can you speak a little bit about that means to you and what you brought to that? Well, it’s great being in a film costarring with Evangeline and that it’s a duo. Actually the female character I think is the one who’s really better suited for the job, in all honesty. It’s a family business, and she’s born into it. That it is multi-cultural, that I love the fact that it is an extended family, that my ex-wife and her new husband, like we all get along really well. It takes a village- (laughing) So, you know, kind of speaking to that stuff is important. We put a lot of thought into it, and it’s nice to be a part of something like that. Can you talk about filming with Abby? She looks like a natural. And she played off of your character exceptionally well. Abby, the girl who plays Cassie, is very talented. She’s a really good actress and a good kid. And it was our second time working together, so I think she trusts me, we get on really well. I love working with her, and I love doing those scenes with her. I like working with kids because you don’t really know what they’re going to do and you just kind of go off of what they’re doing and if you can establish a relationship outside of the filmmaking. Just hanging around the set, it can be really fun to film scenes with kids. As far as my character doing a scene with a girl playing my daughter, it’s not far off. My daughter is a little bit younger but not much. And those kinds of scenes are accessible to me because I’ve been in them, I know what that’s like. And I also- it’s one of my favorite things because I share that with my own daughter. And she loves it. At first, when she was very young, I used to think, is it going to be weird when my daughter is old enough, and she sees this movie, that she’s going to see me playing dad to a little girl. And instead, it’s the opposite. I think really loves it, because I tell her, “You know, you’re the real Cassie.” I do little things in the movie that are little things for her. What’s it like working with Michelle Pfeiffer? I mean she’s the best. (laughing) She’s just a really lovely person. I’ve worked with her before, and it was great because I hadn’t seen her in a while and she was a very very sweet person. Very smart. Very funny in ways I think people might not know. She’s very wry, and she’s got a real stealthy cool sense of humor. We spoke to Hannah and Michael both, and they both thought the world of you and how nice you are and how easy it is to work with you on the set, so what can you say about the rest of your costars on the set? All right well this has turned into a lovefest for sure. Well, Hannah, I met on this film, and she’s really-really talented. I’d seen her in other things, and I was like, oh she’s really good. And just cool. And we talked about music. And as far as Michael, I love him so much. It’s such a thrill when you get to work with legends and certainly he, Michelle and Laurence Fishburne I feel like they’re making this legitimate. I mean,(laughing) they’re icons. You can do anything with Michael Douglas, and it just has gravitas. And he’s been in so many films that I’ve loved for so long, all of us really. And I’ve said as much as I admire and appreciate him as an actor, I have now come to admire and appreciate and love him even more as a guy, as a friend. And when he’s on set, he’s just he’s just so kind of funny and easy going. We’ve gotten to the point now where we can talk about life things, not just script stuff and movie stuff and instead, world events and sports and families. We talk a lot about our kids. I feel like we’ve become friends which is still baffling to me, that I can say he would be a friend. But I really love the guy. 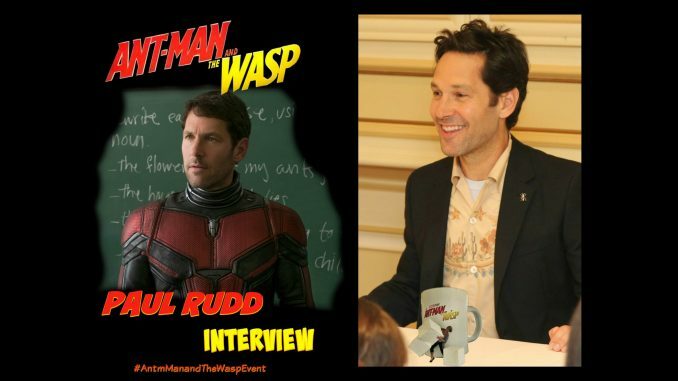 Hey Buddy!, I found this information for you: "Paul Rudd Ant-Man and The Wasp Interview". 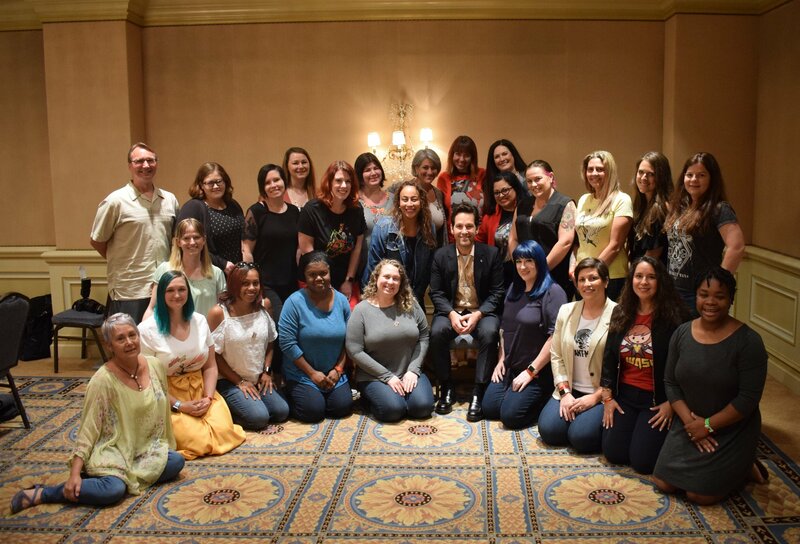 Here is the website link: https://www.trippinwithtara.com/paul-rudd-ant-man-and-the-wasp-interview/. Thank you.